These articles are written by independent authors and post here to possibly spark and idea on how YOU conduct business. We listed the publisher and author of each article in case you want to read further on any of these subjects. The Influencer Marketing Gold Rush Is Coming: Are You Prepared? Many new companies revolve around their founders; a business built to flip cannot. “You want to build a culture, not a cult,”. Part of that is distributing responsibilities throughout the organization. The buyer needs to know that the business can survive without the founder, and the founder needs to concentrate on growing the company, rather than taking care of day-to-day operations. Make sure to use a software program that list what each person’s responsibility withing the company. This will help the potential buyer understand the day-to-day operations of each salesperson, director, key staff members etc. Rule 2: Ability to Scale. 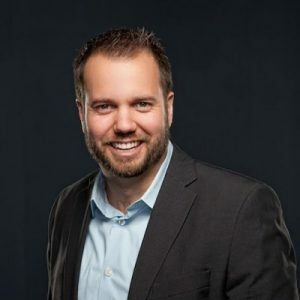 Startups get acquired because the acquirer believes they can scale up the company, “If the company is held together with duct tape and baling wire, it won’t scale. Even though they start small, entrepreneurs have to think big from day one.” Key areas to pay attention to when trying to determine and scale your business-Get the basics down. …Automate Everything. …Boost marketing. …Outsource non-essentials. …Keep an eye on social media. …Excuse yourself. …Hire the right people (and only the right people). It’s not just the product concept that needs to be simple, but the business structure, too. The founder’s own investment in the company he or she is attempting to flip must be free of entanglements. One, founders must learned to keep their transactions transparent and to track them diligently. It’s easy for entrepreneurs to get sloppy about putting money into and taking money out of their own company. What’s more, if founders are arguing about ownership, the buyer is likely to balk. Be cautious that anyone planning to sell should avoid commingling of personal and company funds. There is no better feeling when your start-up is acquired for millions of dollars and as the founder you know that you is essential to have an exit plan in the beginning so you should start with the end game in mind. Ready to get the most out of your business. Sign-up for a weekly dose of free business resources to scale your business to the next level. Value. 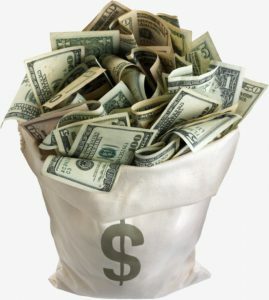 What are your services really worth? What do your clients get as a result of buying your products or working with you? The price you place on your products and services is really no more than what you think you are worth. One woman I worked with charged $90 an hour for coaching; yet in reality, she worked three hours for every hour she billed. Another used to run a $500 million dollar business division. Now that she owned her own business she was concerned that she didn’t have enough experience to charge $200 an hour for her services. Another client shared with me that she had sold over a million dollars in $20 t-shirts, by speaking from the stage. She wondered why anyone would be interested in how she did it. She figured, if she could do it, it must be easy and everyone knew how. We easily see the value in others. We also accept the valuation cap that others place on us. When I left corporate America I declared that my goal was to replace my salary minus my commuting and babysitting expenses. I replaced my salary quickly, yet earning so much as a dime more than that took three years. Why? It was because I accepted Wall Street’s valuation cap of me as gospel and didn’t look inside myself to figure out what I was really worth. They don’t fully acknowledge the real benefit that their clients receive by working with them or from their products and services. They lack confidence and believe that they need another degree or certification before they can “do” whatever it is they do. They under-value their own education and experience. For entrepreneurs who enter a “new field” their previous experience adds to who they are and what they can deliver. For entrepreneurs who have been working in their business for a while they often feel like they are one-step behind where they need to be before they can raise their rates. We base our rates on what others are doing and not on what our clients get from working with us. When you don’t understand your true value you cannot charge what you are worth. AND you are also likely to approach sales conversations with trepidation instead of confidence in your ability to deliver value to clients. 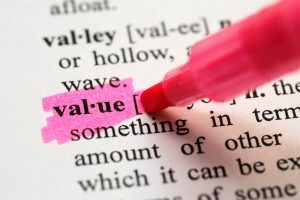 I believe there are 5-componets to the VALUE you place on yourself and therefore the prices you charge your customers. Your VISION: What you see for yourself, your business and your clients. Your ACTIONS: What you do on a regular basis to support your vision. This includes the projects you choose to take on, the opportunities you pursue and what you decide not to do. Your LEARNING: What you’ve already learned and continue to learn both formally and through your experience with clients and the world around you. That you are UNIQUE: The experiences you’ve had both in and out of the workplace add to the person you are and your ability to provide your service. That you are ENOUGH and have the right to say “ENOUGH”: You already have enough certifications and experience to help someone. You also have the right to say ENOUGH. To say no and set boundaries. You don’t have to work with everyone; you don’t have to say yes to every opportunity. You can say yes or no depending on whether or not they support your vision for yourself and your business. The better able you are to recognize your V.A.L.U.E. the easier your business will be to run and the happier it will make you. Answer the following two questions to help you to start assessing your own V.A.L.U.E. When someone decides to work with you and invests in your products or services what do they get or what can they achieve because of it? Now take it deeper… ask yourself: So what does that give them? Marketing always has a trending buzzword. Several years ago, it was content marketing. Before that, it was social marketing. Regardless, as soon as the buzz grows, so does the number of brands investing in it. We’ll call this the Gold Rush. Now, with topics like ad fraud and ad blocking on the rise, budgets are shifting toward earned media. Companies want distribution options that won’t be blocked and that they know can reach the right audiences. This leads me to believe that we’re about to see an influx of marketing dollars into influencer marketing programs. Why? Influencer content cannot be blocked, external influencers are being created every day, and the best way to gain customer trust is by aligning with somebody they already trust. Basically, influencer marketing is about providing product context and expertise through an inspirational person. Digging deeper, I prefer to break influencer marketing companies into two types: earned influencer marketing and paid influencer marketing companies. Earned marketing stems from unpaid or preexisting relationships with influencers — those who are natural brand advocates. For example, Patrón has a ton of influencer advocates for its tequila; these people drink the liquor regularly and endorse the product because they enjoy it. On the other hand, you have the paid arm of influencer marketing, in which brands employ the Kardashians to tweet about their products or services. 1. Identify potential earned influencers. Identification of natural advocates is the foundation. Not all companies produce a cool tequila that Tom Cruise drinks in his movies, yet many brands make the mistake of skipping this step and immediately spending money on paid influencers before considering natural options. Think about it this way: There’s one thing that influencers like almost as much as money — and that’s more influence. When both members of this influencer partnership have equity to offer, natural brand advocacy occurs (or at least offers your brand greater leverage in negotiations). You should constantly identify influencers to add to a list of targets. From tech influencers to marketing influencers, plenty of existing lists offer prominent prospects. 2. Begin to build your own influence first. Strategies for building your influence span the spectrum. For example, you can invite influencers to speak at an event you’re hosting with an audience that shares your interest, or you can mention or quote them in content you are already creating and distributing. Any familiarity with your brand you can offer an influencer is valuable. Then when influencers write, tweet, share, or speak, it’s natural for them to mention you as a brand they support and that supports them. 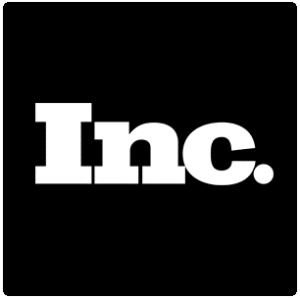 Perhaps the best example of a brand that has successfully done this is HubSpot. 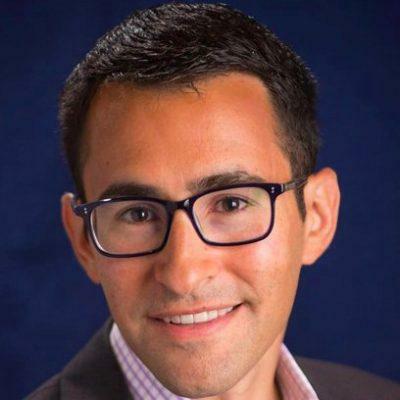 By leveraging content relationships with influencers such as author Seth Godin and entrepreneur Jonah Peretti, HubSpot built an event, INBOUND, that provides those influencers with a platform to speak while using their name recognition to get people in the door. The idea of influencer marketing is simple, and the key is mutual benefit. Advertising budgets are moving toward easily disseminated and unblockable media. But before you rush to spend time and money on a strategy you’re unfamiliar with, now’s the time to start building your own influence and audience that will offer value to potential influencers. Earn media until you can’t any more, and once you plateau, consider the paid sector. But, as always, scale your efforts: A poorly tended strategy is not a strategy at all. What makes these leaders stand out from the rest? IBM’s Watson did some digging. 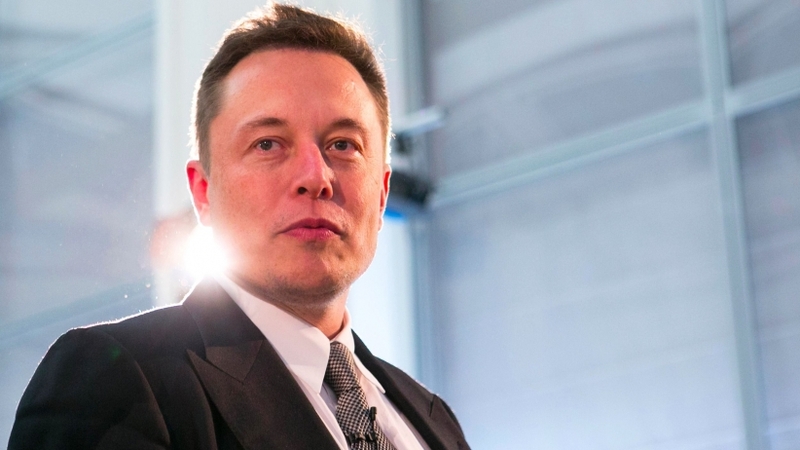 From Bill Gates to Meg Whitman to Elon Musk, today’s most renowned business people innovate, inspire and create. However, what makes these individuals so different from the rest of us? What traits do they possess that make them so successful? With the help of IBM’s supercomputer Watson, online career management website Paysa sought to uncover the common characteristics of top business leaders. Using Watson’s Personality Insights program to analyze speeches, essays, books and interview transcripts of today’s most powerful leaders, the company discovered what puts these people at the top. Of eight surveyed industries, entertainment, fashion, finance, law, marketing, media, medicine and politics, Watson discovered that “intellect” was the top personality trait for leaders in a majority of these fields. Watson also rated the amount of certain characteristics it identified in leaders across the various industries. It found that 90 percent or more of leaders in entertainment, fashion, law, media, medicine and politics carried the “intellect” trait. Out of all analyzed industries, leaders in fashion scored the highest percentage of intellect at 98 percent. To the contrary, leaders in finance had the lowest intellect score at 83 percent among the analyzed fields. On top of intellect, altruism was the second most common leadership trait for most industries. Other top traits varied from industry to industry but included imagination, cautiousness, assertiveness, authority-challenging, adventurousness and more. So who exactly are these imaginative and altruistic leaders? Watson found the answer. 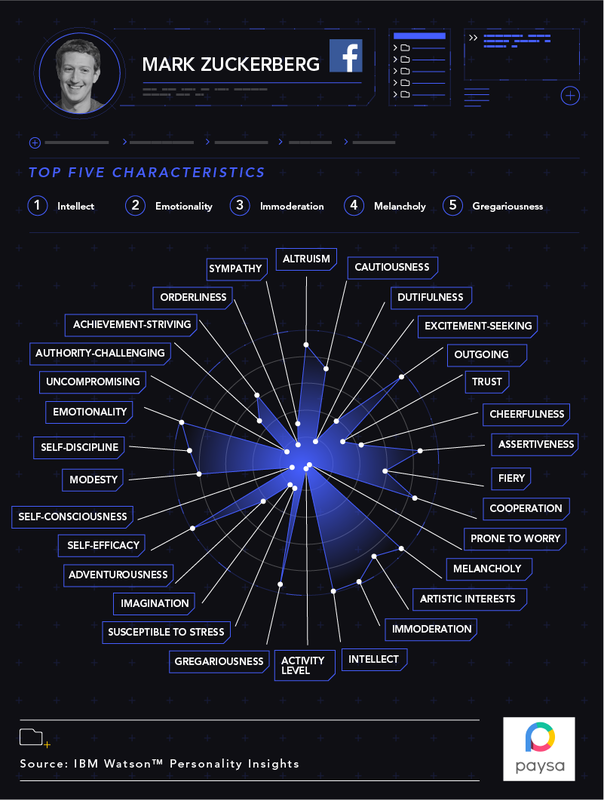 Diving deeper, the supercomputer analyzed the personality traits of today’s top tech leaders and uncovered who falls where in terms of most imaginative, assertive, achievement-striving, altruistic, cautious and uncompromising leaders in tech. Tech leaders are often recognized for using their resources to improve the world and enhance the wellbeing of others. That’s why it’s no surprise that altruism was the highest scored trait among the techies. 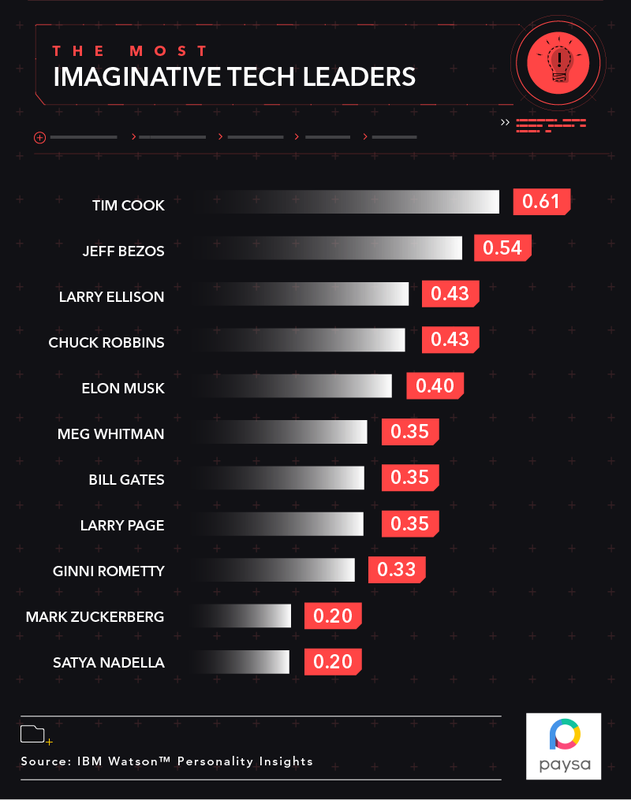 Above all, Bezos, Cook and Meg Whitman each tied for “most altruistic leader” at 98 percent. Whitman also topped the list for the most “achievement-seeking leader.” Before Hewlett Packard, Whitman held executive roles at Hasbro, Disney and eBay and in 2008, she made The New York Times’s list of women most likely to become the first female president of the U.S.
Of all top tech leaders, Mark Zuckerberg seemed to exhibit the least amount of top common success traits identified by Watson. Although that doesn’t mean much — the Facebook co-founder and CEO just has his own set of unique traits that make him stand out. Rather than being assertive or cautious, one of the youngest, richest leaders of Silicon Valley was identified as having intellect, emotionality, immoderation, melancholy and gregariousness as his top five traits. 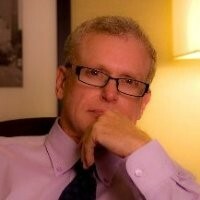 I interview business leaders, celebrities and authors. I’m constantly interviewing successful people here at Forbes. Since 2007, I’ve spoken to over 1,200 CEOs, celebrities, authors, politicians and even an astronaut. When speaking to these individuals, I always notice common traits that they all have, which lend to their success. I’ve boiled all of these into the top 14 things that all of them have in common. If you can think of any additional ones, leave them in the comments. 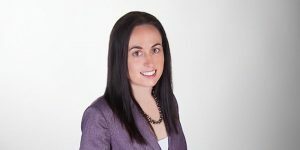 Editors’ Note: Following the huge popularity of this post, article source Amy Morin has authored a guest post on exercises to increase mental strength here and Cheryl Conner has interviewed Amy in a Forbes video chat about this article here. Make the Same Mistakes Over and Over. We all know the definition of insanity, right? It’s when we take the same actions again and again while hoping for a different and better outcome than we’ve gotten before. A mentally strong person accepts full responsibility for past behavior and is willing to learn from mistakes. Research showsthat the ability to be self-reflective in an accurate and productive way is one of the greatest strengths of spectacularly successful executives and entrepreneurs. He invented the phonograph despite being deaf, was reported to be working on a telephone that could communicate with the dead, and said that sleep was a waste of time. Thomas Edison, world renowned for creating the commercial light bulb – was seen as a ruthless, money-hungry businessman. But the truth, as viewed today – 86 years after his death – is that Edison was a misunderstood believer in bringing great ideas to the masses. Motivated as much by helping people, as he was by money, Edison’s brand of determination has lessons for us today, in a world where giving up is all too easy. Did Thomas Edison really try 10,000 times to improve the light bulb all on his own? Today, historians say the famous claim by Edison is untrue. Edison was not alone, employing a team of 14 engineers and designers who tried many different methods to make the light bulb last a long time. Depending upon the source, the number of attempts may have been as little as 1,000. Despite the separation of truth from myth – there was no denying Edison’s relentless pursuit of his goals. He did not view any activity as failure, but rather, “attempts” to succeed. Whatever we do in life, we need to position our lows as building blocks, not dead ends. Edison had no patience for what he considered pointless corporate rules. He encouraged his team to try every idea and pursue every lead. Today, many rules stifle creativity and free thought. Managers need to toss away their fears and allow people to experiment and push the envelope as far as possible. That, after all, is good business sense. Nothing can substitute hard work. Edison was smart to be sure, but his accomplishments came mainly from his determination. Part of Edison’s remarkable resilience was his ability to accept whatever happened, followed by a commitment to start over until things met his satisfaction. When his laboratory caught fire, destroying many important findings and research, he simply said, “We start rebuilding tomorrow.” Today – we too can embrace the attitude of Edison, and nothing will stop us. Thomas Edison was a madman when it came to inventing – developing the phonograph, motion picture camera, the first long-lasting light bulb – and even a battery for an electric car. In all, he held 1,093 patents, more than anyone else in his day and anyone in the world up until 2003. Edison was a big self-promoter too, guilty of taking all the credit, even though his assistants did most of the work. It is said, however, that Edison’s team didn’t mind so much, knowing that the name “Edison” was a powerful brand from which they could benefit. His entrepreneurial spirit began at an early age, selling candy and newspapers on trains. Slow in school, he was taught by his mother who noticed his incredible curiosity, giving him a book on chemistry. That inspired the young Edison to build a laboratory in the family’s cellar. (Edison would later credit his mother for his success in life). He was said to be poor at mathematics, yet could see things others could not. Edison once remarked that sleep was a waste of time, claiming he could get by with just 3 or 4 hours a night without ever dreaming. But he had a secret weapon: power napping. 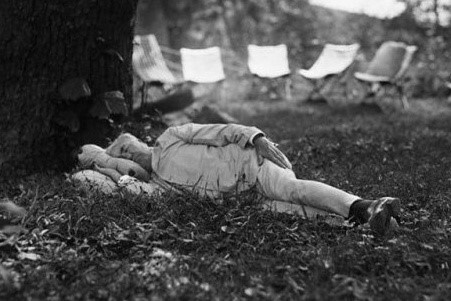 The year is 1921 and Thomas Edison is seen taking a power nap under a tree. Despite boasting that he could get by on little sleep, Edison used many naps during the day to recharge his creative mind. It is said he was capable of falling asleep in under a minute, any time – any place. If he could not solve a problem, he napped – then awoke to try an entirely different approach. 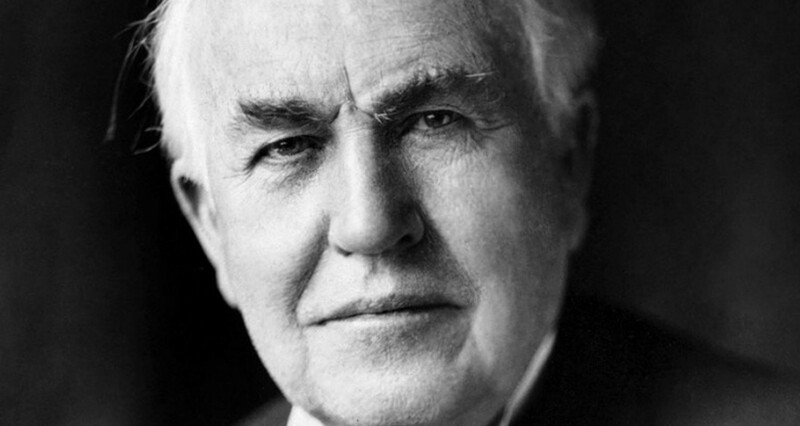 Thomas Edison was hard of hearing or close to deaf for most of his life. He had claimed his ears were injured as a child when a train conductor lifted him up by the ears after a chemical experiment on the train caught fire. But historians say, more likely, Edison became deaf from a bout of scarlet fever or untreated ear infections. Edison is best known for inventing the modern-day light bulb. Before then, other inventors had created bulb’s that would burn out quickly. But not everything Edison tried was successful. Among his failures was an attempt to improve upon X-Ray technology. The problem was that Edison had no idea what he was doing. His assistant, Clarence Dally, received severe burns, lost both arms and died from radiation poisoning. Edison himself received permanent damage to his left eye and stomach – and the tragic loss of his assistant during the X-Ray experiments would emotionally scare Edison for the remainder of his days. In this rare but incredibly well preserved photo taken in 1877 or 1878, a young Edison is seen with his favorite invention – the phonograph (which he worked on for an incredible 52 years). Edison discovered that vibrations made from speaking could be recorded onto a metal cylinder wrapped in tin foil. He gave plans for the phonograph to one of his assistants who reportedly built it in under 30 hours. 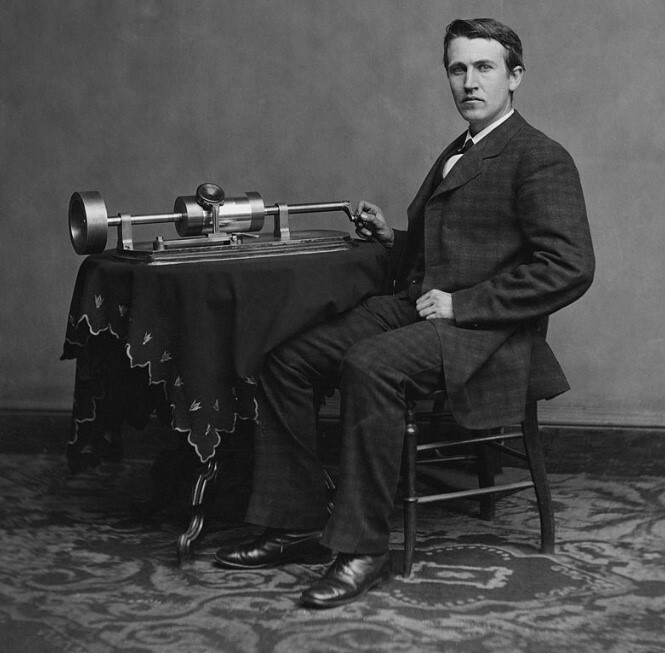 The machine sold for $20 in 1899 but 30 years later, Edison would give up on his beloved phonograph as new technology took hold. By his 30s, Edison was a multi-millionaire. Yet, he spent surprisingly little money on himself, preferring to finance his inventions and businesses. But he did purchase a 23 room mansion as a wedding gift for his second wife Mina. He was 39, she only 19. By all accounts, it was a loving partnership of mutual respect, and today, the two rest side-by-side in a garden behind the mansion. While wealthy, Edison was not happy with America’s banking system, considering it to be corrupt. In particular, he considered the charging of interest on loans to be evil. Edison proposed that banks lend money to farmers interest-free based on the value of their crops, an idea that never caught on. At age 59, Edison decided to purchase the home where he was born but was horrified to discover years later that it was still being lit by candles. This hard working inventor continued to work until the day he died. That day came in 1931, when, at age 84, Edison succumbed to complications from diabetes. It’s believed his final words to his wife were: “It is very beautiful over there,” an apparent reference to the afterlife. Thomas Edison left a legacy of innovation and business smarts, showing us all what is possible if we just never give up. Among Thomas Edison’s ventures was a movie company that produced the first Frankenstein film in 1910. Edison, because he was deaf, enjoyed silent movies. But when sound made its way onto the screen, he was unable to follow the dialogue and lost interest. Edison’s electric company became what is today General Electric. Dr. Travis Bradberry shares the unique habits of some of the world’s most successful people. Try them out and see where they take you. They focus on minutes, not hours.Most people default to hour and half-hour blocks on their calendar; highly successful people know that there are 1,440 minutes in every day and that there is nothing more valuable than time. Money can be lost and made again, but time spent can never be reclaimed. 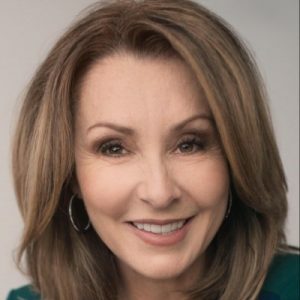 As legendary Olympic gymnast Shannon Miller told Kevin, “To this day, I keep a schedule that is almostminute by minute.” You must master your minutes to master your life. They focus on only one thing.Ultra-productive people know what their “Most Important Task” is and work on it for one to two hours each morning,without interruptions. What task will have the biggest impact on reaching your goals? What accomplishment will get you promoted at work? That’s what you should dedicate your mornings to every day. They don’t use to-do lists.Throw away your to-do list; instead schedule everything on your calendar. It turns out that only 41% of items on to-do lists ever get done. All those undone items lead to stress and insomnia because of the Zeigarnik effect, which, in essence, means that uncompleted tasks will stay on your mind until you finish them. Highly productive people put everything on their calendar and then work and live by that calendar. They beat procrastination with time travel.Your future self can’t be trusted. That’s because we aretime inconsistent. We buy veggies today because we think we’ll eat healthy salads all week; then we throw out green rotting mush in the future. Successful people figure out what they can do now to make certain their future selves will do the right thing. Anticipate how you will self-sabotage in the future, and come up with a solution today to defeat your future self. They make it home for dinner.Kevin first learned this one from Intel’s Andy Grove, who said, “There is always more to be done, more that should be done, always more than can be done.” Highly successful people know what they value in life. Yes, work, but also whatelse they value. There is no right answer, but for many, these other values include family time, exercise, and giving back. They consciously allocate their 1,440 minutes a day to each area they value (i.e., they put them on their calendar), and then they stick to that schedule. They use a notebook.Richard Branson has said on more than one occasion that he wouldn’t have been able to build Virgin without a simple notebook, which he takes with him wherever he goes. In one interview, Greek shipping magnate Aristotle Onassis said, “Always carry a notebook. Write everything down. That is a million dollar lesson they don’t teach you in business school!” Ultra-productive people free their minds by writingeverything down as the thoughts come to them. They process e-mails only a few times a day.Ultra-productive people don’t “check” their e-mail throughout the day. They don’t respond to each vibration or ding to see who has intruded into their inbox. Instead, like everything else, theyschedule time to process their e-mails quickly and efficiently. For some, that’s only once a day; for others, it’s morning, noon, and night. They avoid meetings at all costs.When Kevin asked Mark Cuban to give his best productivity advice, he quickly responded, “Never take meetings unless someone is writing a check.” Meetings are notorious time killers. They start late, have the wrong people in them, meander around their topics, and run long. You should get out of meetings whenever you can and hold fewer of them yourself. If youdo run a meeting, keep it short and to the point. They say “no” to almost everything.Billionaire Warren Buffet once said, “The difference between successful people and very successful people is that very successful people say ‘no’ to almost everything.” And James Altucher colorfully gave Kevin this tip: “If something is not a ‘Hell Yeah!’ then it’s a no.” Remember, you only have 1,440 minutes in a day. Don’t give them away easily. They follow the 80/20 rule.Known as the Pareto Principle, in most cases, 80% of results come from only 20% of activities. Ultra-productive people know which activities drive the greatest results. Focus on those and ignore the rest. They delegate almost everything.Ultra-productive people don’t ask, “How can I do this task?” Instead, they ask, “How can this task get done?” They take theI out of it as much as possible. Ultra-productive people don’t have control issues, and they are not micro-managers. In many cases, good enough is, well, good enough. They touch things only once.How many times have you opened a piece of regular mail–a bill perhaps–and then put it down, only to deal with it again later? How often do you read an e-mail and then close it and leave it in your inbox to deal with later? Highly successful people try to “touch it once.” If it takes less than five or ten minutes–whatever it is–they deal with it right then and there. It reduces stress, since it won’t be in the back of their minds, and it is more efficient, since they won’t have to re-read or re-evaluate the item again in the future. They practice a consistent morning routine.Kevin’s single greatest surprise while interviewing over 200 highly successful people was how many of them wanted to share their morning ritual with him. While he heard about a wide variety of habits, most nurtured their bodies in the morning with water, a healthy breakfast, and light exercise, and they nurtured their minds with meditation or prayer, inspirational reading, or journaling. Energy is everything.You can’t make more minutes in the day, but you can increase your energy to increase your attention, focus, and productivity. Highly successful people don’t skip meals, sleep, or breaks in the pursuit of more, more, more. Instead, they view food as fuel, sleep as recovery, and breaks as opportunities to recharge in order to get even more done.